I attended NCCAT in Cullowhee, NC this past week along with the other Kenan Fellows. 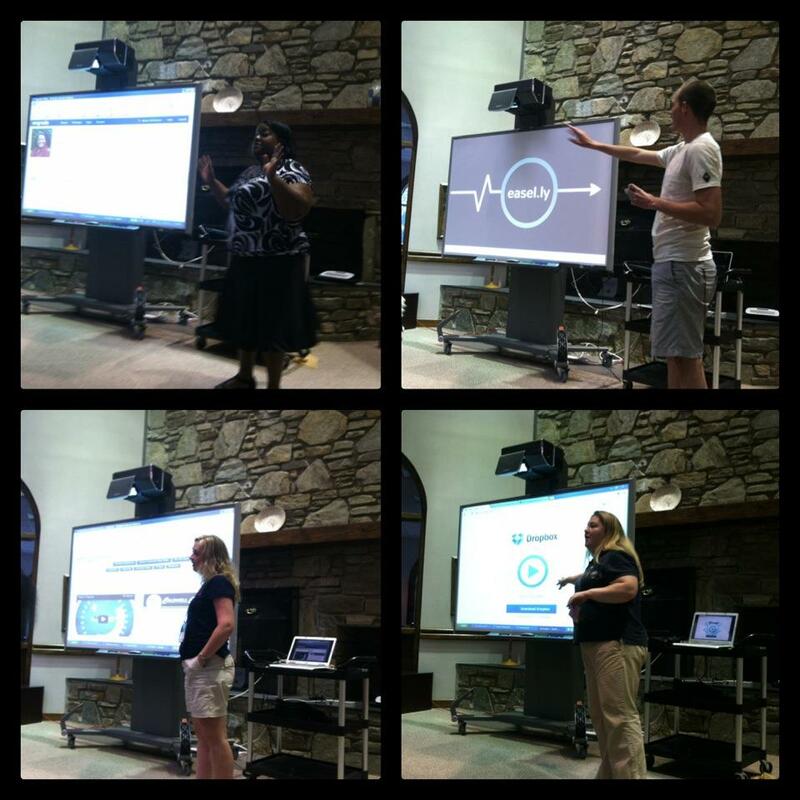 While lots of experiences were built into our stay, the instructional focus was on educational technology. I am passionate about learning educational technology and integrating it into my classroom. Therefore, I was thrilled to be immersed into such a rich technology training environment over several days. It was the most powerfully intensive technology training I’ve ever experienced. In addition to the formal seminars, we the Fellows spent our evenings after dinner together, which became by-choice impromptu “Professional Development on the Patio”. I cannot stress enough the immeasurable value this had. I learned and shared so much late into these warm summer evenings. The icing on the cake was to have the opportunity to learn from others and share in the Thursday evening’s “TED Talk”. In a TED style, Fellows who had volunteered and prepared ahead of time presented a tech tool of choice (or, in my case, two) in under five minutes. These presentations on a smart board were surrounded by couches in seminar rings. It was both amazing and humbling to present alongside and learn from these eleven other educators who had volunteered to share with the group of 44 Kenan Fellows. There were literally over one hundred tech tools shared or presented at NCCAT, and as was stated repeatedly by presenters, no teacher can do them all. During my five-hour drive home Friday, I pondered which tools I was most eager to try with my students and which “tricks” I was most excited to have learned. #10. Livebinders During TED talks, Amy Bradley (above, bottom left) presented Livebinders. While I have experienced them as a user, I was glad to get insight in her five minute presentation on the simplicity of setting them up for others to use. #9. Icecream Sandwich & Notes Mobile Upgrade Really, I should mention Sam Morris’s training on our Lenovo ThinkPad tablets in general. However, I found these specific upgrades to make a the biggest difference in how I will use my tablet. #8. F11 Okay, it’s not an App or tool per se, but I was genuinely giddy to learn from Glenn Gurley that this was a quick was to full screen during presentations on a data projector with my students. #6. easel.ly Vance Kite (above, top right) presented easel.ly during TED, an online infographic maker that allows users to create and share visual ideas online. I loved this! #4. Dragon Karen McPherson (above, top left) and I got App happy one evening, and after Patio PD stayed up later than I’ll report here, just sharing Apps and websites. She had many wonderful ones, but this was one of my favorites. #3. Genius Scan+ Another wonderful one from Karen. It turns my iPhone into a scanner, and uploads it directly to my Dropbox at the click of a button. Awesome! #2. SplashTop App I am most thrilled to have this App. It allows the user to control the laptop attached to the data projector from the ThinkPad tablet anywhere with the class. No more being tethered to the front of the room! #1. Flubaroo If I were in some type of reality show and could only take one tech tool back with me, Flubaroo would be it! I am already using Google Forms with students, but now I envision using Flubaroo regularly for formative assessments. I may even go paperless with homework! Thank you Glenn Gurley, I am forever in your debt! What tech tools should be on my list? What are your favorites for the classroom? I think I am going to really enjoy Genius Scan+. Sounds like a great app. Wondering if any teacher-librarians are in the group. I love how NCCAT includes many in their seminars!